As November means the end of the post season, the barnstorming season begins. In 1908 a special all star team, called the Reach All-American Stars began their 90 day journey from the shores of San Francisco to Hawaii, Japan, China, Manila, Hong Kong, and Honolulu before returning to San Francisco in time for Spring Training. 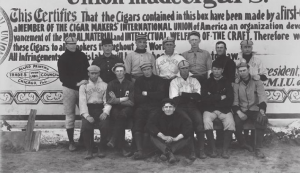 It was the third major international baseball tour, and followed the 1874 British Isles Tour, the 1888-1889 World Tour, and perhaps the most unknown. This was the first Tour to travel to the Japan, China and the Philippines. This tour was sponsored by the AJ Reach Sporting Goods Company of Philadelphia, then an AG Spalding & Bros subsidiary. This tour was beset from the beginning with issues which become a vital element to why this tour remains unknown. Called the 1908 Reach All-American Stars this team were “Stars” in name only. Two players had career averages below .200, and its best pitcher was more famous for his role in the 1919 Black Sox scandal than pitching, the infamous Sleepy Bill Burns – the bag man of the scandal. Their other pitcher went on to play outfield for the Cleveland Indians. It was a team that had more players of note refusing to play for it than play with them: Orval Orverall, Frank Chance, Ty Cobb, and Hal Chase. Moreover their best player was not even an American, but a Canadian Baseball Hall of Fame member and Cleveland Outfielder – Jack Graney. 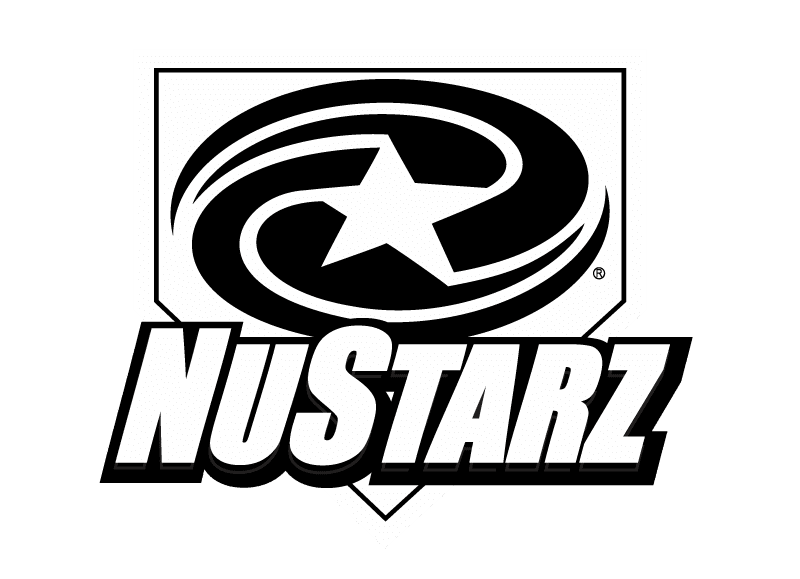 The team comprised of players from the Majors and Pacific Coast League, and sponsored by two people who were outside the realm of professional baseball, so the tour players were marginalized or even penalized for participating in the tour. Of the existing MLB players, only one, Jack Bliss of the Cardinals was on a MLB roster by the end of spring in 1909. One player, Patsy Flaherty of the Boston Beaneaters/ Doves/ Braves, was sold to the minor league Kansas City Blues while still out to sea in early February. It took him three weeks to find out he was re-assigned from Boston to KC when he returned to the USA. The greatest of the players was the Batter of the Day from November 1, Big Heinie Heitmuller. During the tour he was a highly touted prospect for the A’s, but as we know his talents were only on full display for the Angeles of LA in the PCL. The tour also got off to a very inauspicious start. They lost their first game, thankfully they rebounded and won their second game before the boarded their steamer for a two-week tour to Yokohama. 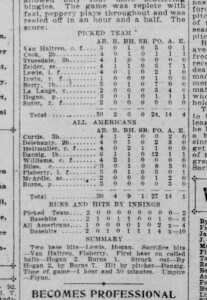 The batting hero of the first game is one player almost completely unknown in Eastern US Baseball, as his entire baseball career was spent in the west. On November 3, 1908 he went 3 for 4 with a double and run scored in leading the “Select” team in defeating the Reach All Americans Stars. His name was Pearl Casey. He was a major person in the PCL and was player-manager of the Tacoma Tigers, Portland Beavers and also the Denver Bears. Not much of a hitter with a career average of .249 with an SLG of .265, he was nevertheless thought highly enough to be selected Player-Manager and Capitan. His primary position was second base. He was a winner, having won Pennants in 1904 with Tacoma and 1910 with the Portland Beavers. His name appears on lists in Sporting Life as being on the reserve list of players for the Portland Beavers and Tacoma Tigers, but not ever making it to the majors. He had a knack for coming through in big games, as he did in in the first game for the 1908 Reach All-Americans vs. the “select team”, 6-1. Batting Clean-up he scored the first run with a double in the second inning, and led to another run in the 4th inning. He did not play the second game that was held on Election Day 1908, November 4. 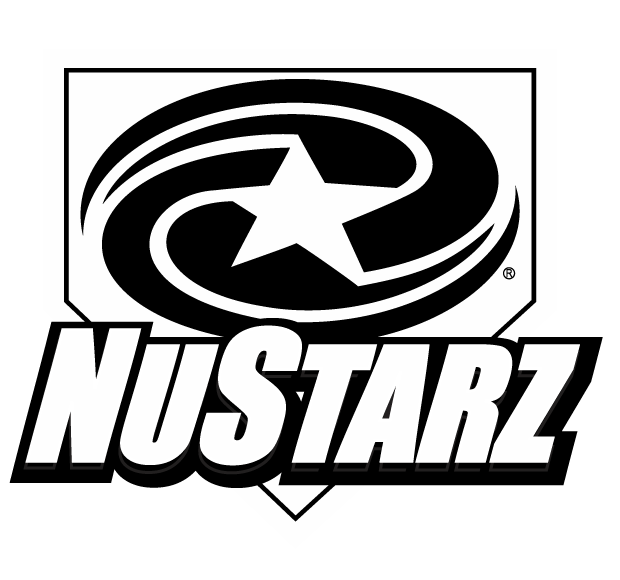 In that game the Reach All-American Stars pulled out the win 4-2. The second game was a result more from the pitching heroics of Bill Burns who after a rough start when he let in two runs, settled down and was in control for the rest of the game. He was just 5-9, 150 pounds of muscle and brains born outside St. Louis, and then moved to California. He was chosen to play in the 1907 PCL All Star team that played in Hawaii, but then refused to sign up for the tour to Asia the following year. 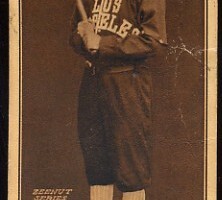 He played a total of 12 seasons from 1900 to 1911, seven of which were in the PCL. His best season might have been with the 1904 Tacoma Tigers that won the PCL crown, and one of his worst seasons was with the famous Fresno Raisin-Eaters, the worst team in the history of the PCL 64-117 (.353). Yes the Mets had a worse record, but these Raisin Eaters where so bad they had to forfeit games because they ran out of pitchers in extra-inning games at seasons’ end. Casey began his career in Denver as an 18-year old infielder with the old Denver Bears, shown here in their team photo, back row second from the right in the dark sweater. 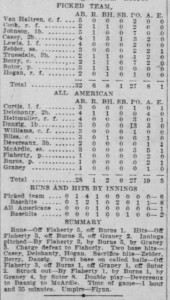 The box score for the game on election day 1908, November 4. Burns went the distance giving up just 4 hits in the last 8 innings. The best hitter on the All-Americans was the home run hero of November 1, Heine Heitmuller with two hits. Snelling, Dennis. The Greatest Minor League: A History of the Pacific Coast League, 1903-1957, McFarland Publishing: Jefferson, NC, 2012.